Thank you for using Paris. To request License Codes, please select your region and fill in all of the details below. Include the Entry Code and Computer ID from your software. Each Paris component will require its own License Code. You may submit up to 5 component requests on each request. We will respond via email within one business day with your License Code. If you encounter any issues with this form, please contact XLPrint Support directly. Paris global support is provided through three regional centers. Please select your region from the options below to ensure that your request reaches the correct team. Submit a License Request for each component or otherwise request multiple component licenses (up to 5) in one request by expanding and completing the sections below. Paris is a non-perpetual license requiring payment of an Annual License Fee (ALF) each year to remain current. License Codes will only be issued for current licenses. By clicking on the "Agree & Submit" button below, you are agreeing to being bound by the terms of your Paris software End User License Agreement (EULA). Your request for License Codes has been emailed to the administrator at XLPrint. You will receive an email reply within one business day. 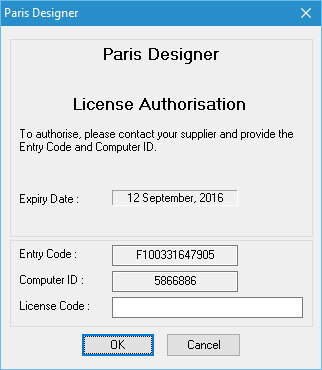 How do I Authorize my Paris software ? To Authorize your Paris software you will need to send us the Computer ID and Entry Code for each module. You may select "Cancel" to continue using the software in Trial Mode. We will then generate the respective License Codes and email them to the email address provided. You may then enter these in the space provided in the Authorization screen to complete the Authorization process.